Burgerz has shops in The Hague, Delft and Scheveningen. 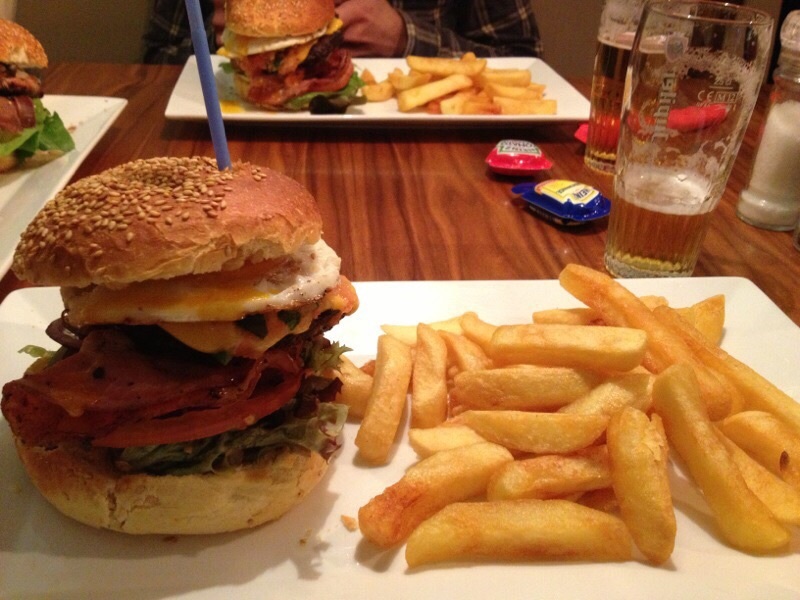 The first real burger restaurant in the Netherlands I went to was Burgerz, back then I still lived in The Hague. I think I went there in total for about 3-4 times. I tried beef, chicken and half beef half pork burgers, all of them are really good! But the milkshake was even better! I could easily drink 2 of them with my burger. Service depends a bit on your luck, sometimes they are very fast, sometimes they are very slow… Overall, the quality of the food is good. The burger is huge and good and you get crispy fries for a reasonable price. You can even take away burgers with a discount price. One other thing I liked about Burgerz is that you can choose from many different types of buns for your burger, it adds more variety to the burger. it is bigger than my fist! 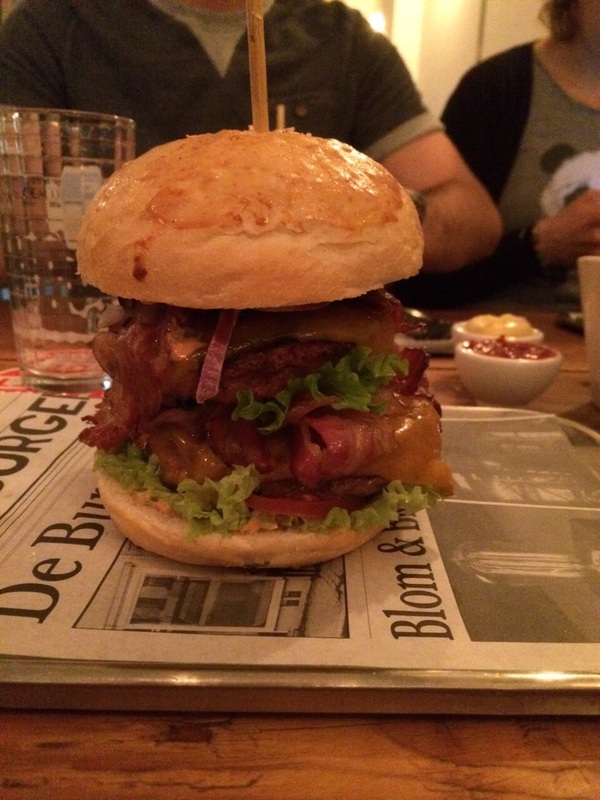 I went to De Burger after I moved to Eindhoven. The restaurant’s interior is very funky and old school. The cheapest burger is only 7.5 euro here :D. I went twice to De Burger and the service was really good, fast, and warm. I tried the beef burger and the three mini burgers. The beef burger was very tender, juicy and you can taste it is fresh and good quality meat. When I had the three mini burgers, I tried the salmon burger, the veal burger and the 50/50 burger (beef and pork). The veal and 50/50 burger were very tasty. However, the salmon one was not that great compared to the other two. The salmon burger was quite fishy in my opinion, which made the taste a bit overwhelming. De Burger offers great hand-cut crispy fries, served with home-made ketchup and mayonnaise. No need to mention, the burger is huge as well!! 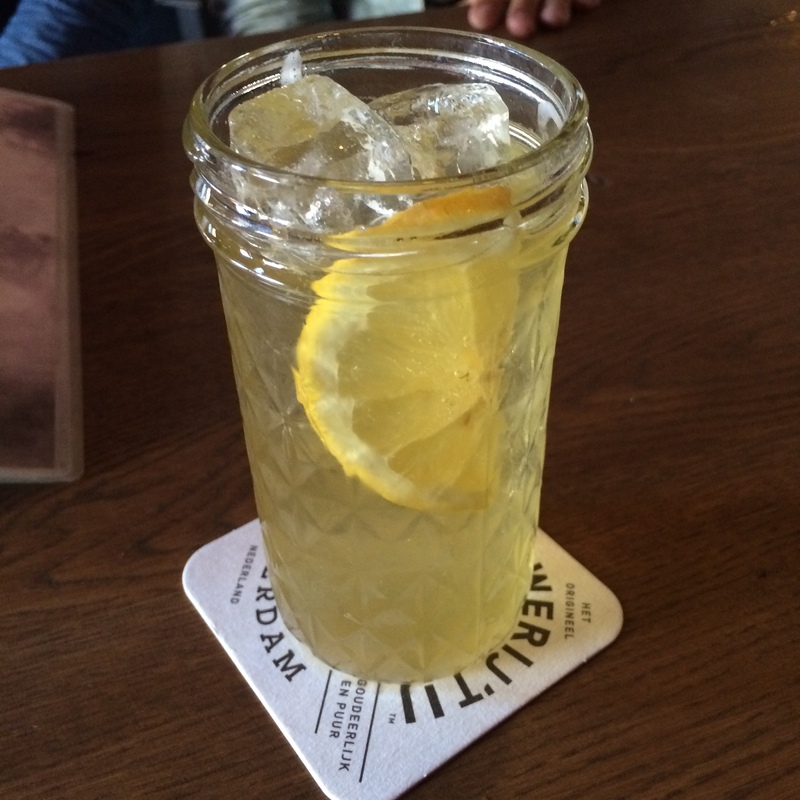 You can find Firma pickles, also known as Burgers and wines, in Utrecht and Markthal in Rotterdam. I went to the one in Rotterdam, it is a very crowded and popular place in the Markthal. I had lunch there on a Friday and it was quite packed around 12.30, something I like about the restaurant, it is very bright (it was day time haha). I guess I made a pretty strange choice since I chose the Gamba burger, unfortunately it was a bit dry. The combination of the ingredients of the burger was not bad though. The thin-cut French fries were not greasy. Alongside your burgers and fries they gave you a type of salad which I didn’t fully get, it seemed like and reminded me of a KFC salad…. The service is very fast even when it is quite busy. Nevertheless, I found the burger (at least the one I took) nothing special. Maybe next time I will try the beef burger, because my mentor said the beef burger she had was pretty good. According to her, the meat on the burger tasted like actual beef, which according to her is a rare thing, I think that is a pretty good compliment. This is the last review today, and also my favourite one. 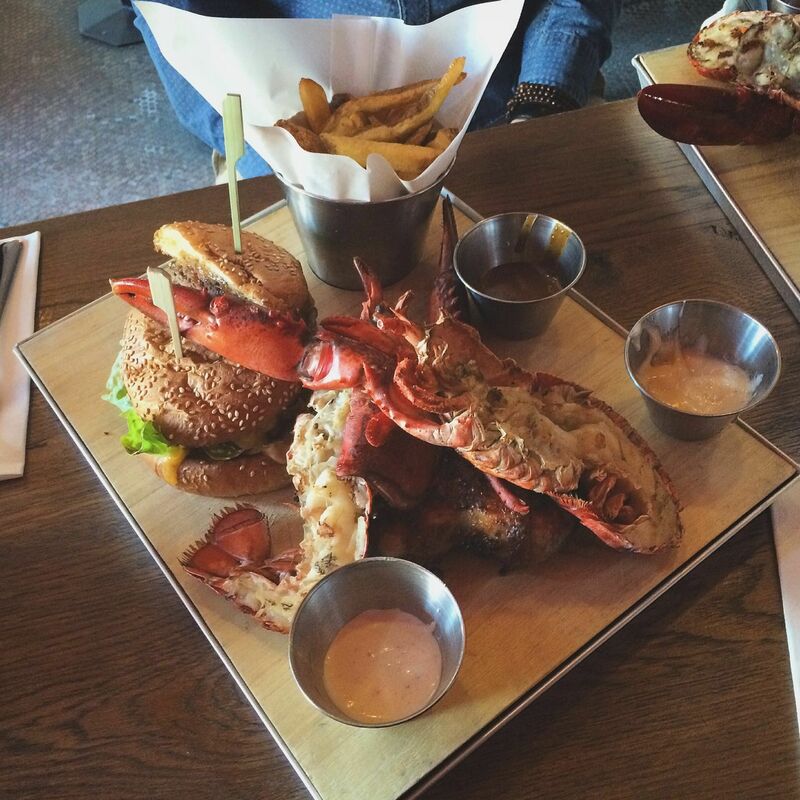 Smoking Barrels is located in Amsterdam, the concept is surf and turf, so their specialities are burgers and lobster. The service was great, fast, kind and they offered to take a picture for us (we went there with 7). 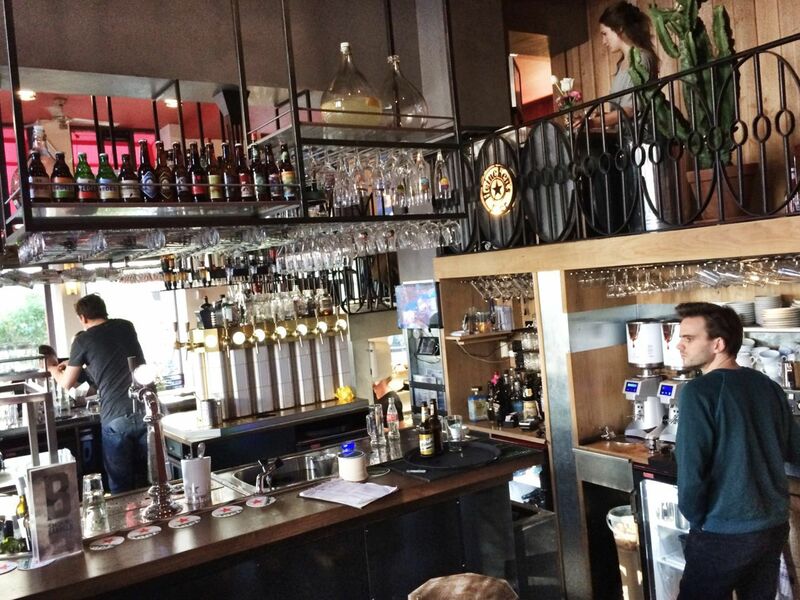 They have a comprehensive list of beers and beverages, picture one was a beer cocktail. 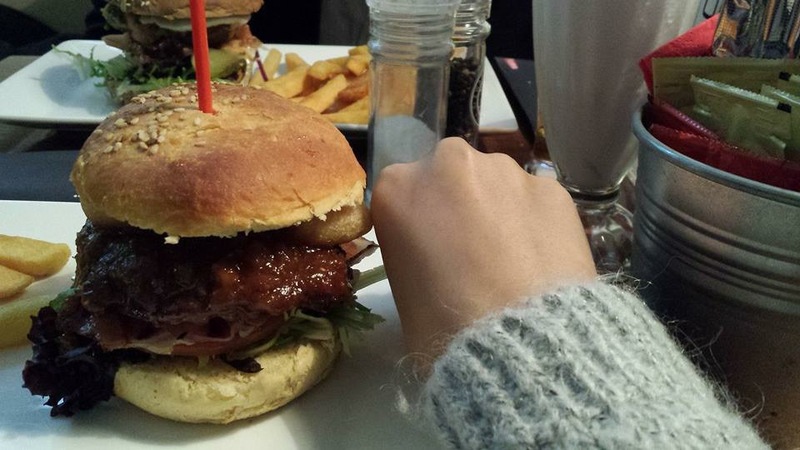 I shared the “burger, poussin and lobster” menu with my friend. 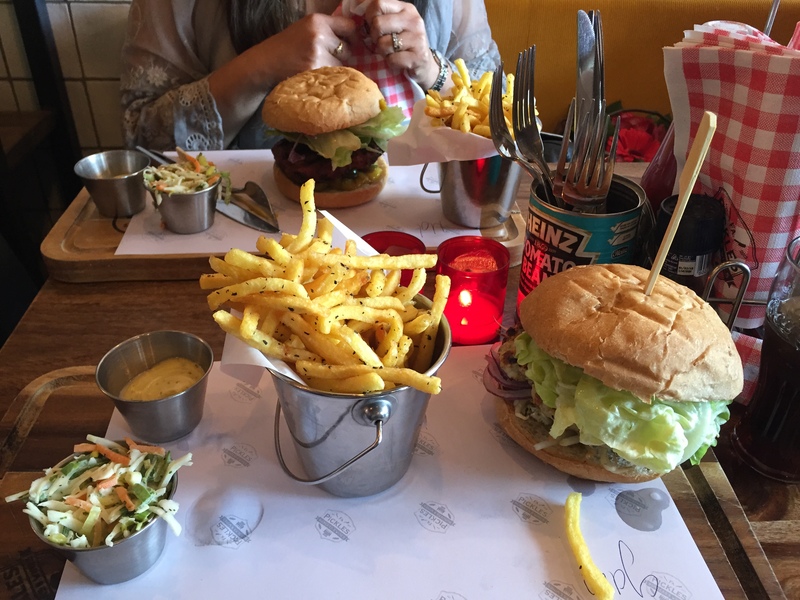 So each of us have half burger, half boiled lobster and ¼ poussin (charcoal grilled chicken), the menu come with fries and salad. Unlike fries in other burger restaurants, they are not that crispy, but you can still taste the potato which I really like. Salad was simple but good. I had half chicken/mango burger with a curry mayonnaiseand it was prefect. It was very very tender, juicy, and the mayonnaise made it a bit spicy . Now let’s talk about the lobster, I have been craving for lobster for a while now and this completes my wish. The lobster was very fresh and well cooked. For the chicken, it was very juicy and tasty however it was a bit salty. I think in the end it was 28 euro per person (excluding tips), which is very affordable for good food.You can sit outside as well, but be there before 19 in the weekend, otherwise you probably won’t have a place, and they do NOT take reservation.